As of writing this review I’ve seen 4 movies released this year. 12 Strong is the best one I’ve seen so far. This film is far from perfect but the good outweighed the bad. In my non-professional opinion the only negative aspects of this film come from the story. The problem with criticizing the story is that it’s based on fact, so it’s not the writers fault if they are merely writing on fact. Obviously, some things can be embellished for dramatic effect but completely changing the story or adding new elements would take away the integrity of telling a true story. With that being said, this story falters with a lack of character development and a lack of any real stakes considering the conclusion of the film. 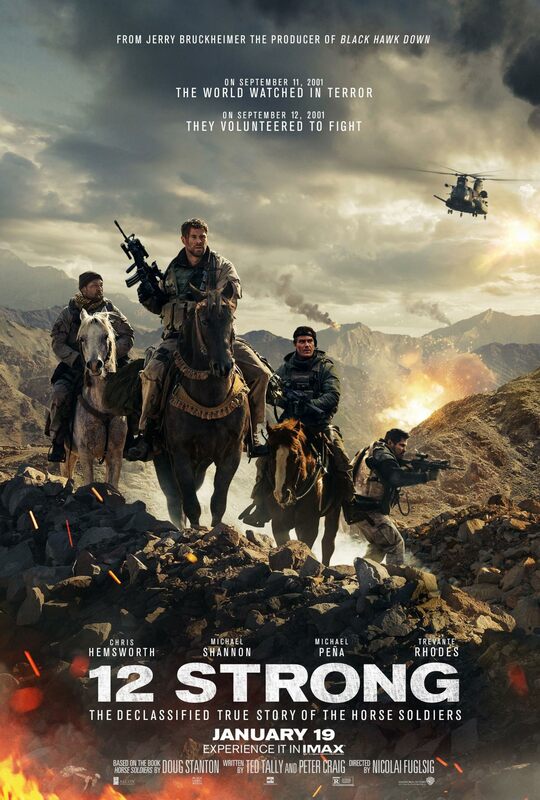 If you can put those behind you when watching, 12 Strong is a good time that’ll make you proud to an be America, if you’re not American there’s still plenty to like in 12 Strong. I liked a lot in this movie but what I liked the most was the characters and their chemistry. Upon the minute of meeting the members of Task Force Dagger I was rooting for them. Their camaraderie felt so natural, the chemistry they all share would lead you to believe they all knew each other for years. In general, all the members of Task Force Dagger were likable characters and most of them got one or two moments to shine, but the standouts were Chris Hemsworth, Michael Peña and Michael Shannon. Chris Hemsworth is without a doubt the star of 12 Strong. We spent the most time with him on screen. He played an American hero so well that I almost forgot he was Australian. His character Mitch Nelson is also the only one to get any character development, mainly in the form of his relationship with General Abdul Rashid Dostum. Dostum wants to stop Al Qaeda but he wants to do it his way, Nelson has his orders and needs to follow them. The companionship the two create is almost comforting in a time of war. Michael Peña is 100% the comic relief of the film, all his team members bring laughs but he brings the most. In a film about the aftermath of 9/11, I never thought I would laugh as much as I did watching this movie. Watching Task Force Dagger is like watching a bunch of dudes being dudes, they crack jokes and make fun of each other. Except in this situation they aren’t your run of the mill bearded jacked dudes, they’re American heroes. After Hemsworth, Shannon gets the most screen time. The guy is a good actor and you can’t deny it. The humor is an important aspect of 12 Strong, this is a rather dreary and dower subject, a laugh here and there gives some well need levity. 12 Strong is a very well shot film, this is Fuglsig directorial debut and honestly you can’t even tell. The action is wonderfully crafted and choreographed. Watching the war scenes made me feel like I was watching someone play Call of Duty and I’m not talking about some wonky multiplayer action, I’m talking about CoD’s cinematically perfected campaign cut scenes. I’d love to see Fuglsig helm a big budget action movie. Also for a film that is 2 plus hours, this one is well paced. The film flys by. One last thing before I close this up, shout out to all the horses in 12 Strong, great animal stunt work. Those horses are better actors than Johnny Depp and Jared Leto. 12 Strong is a remarkable true story full of camaraderie and shockingly considering the subject matter contains a happy ending. The best movie of the year, so far. I give 12 Strong a 7.6 out of 10, would watch again.